Saints Row as a franchise has been a very unique journey, but one that makes a twisted sort of sense. You went from gang member, to gang leader, to pop culture icon and now you’re the president of America. Saints Row IV also adds aliens and super powers, so clearly Volition’s just throwing caution to the wind at this point. Saints Row IV as a follow-up to Saints Row the Third is in the difficult position of taking place in a city that players have already experienced. Steelport is smaller than Stillwater, the setting for Saints Row and Saints Row 2, but it grew and changed as the story progressed. This time, via a terrible alien invasion, the city of Steelport has been changed slightly due to all the various new alien structures. However, before we get to experience this strange revamp, we have to make some presidential decisions. 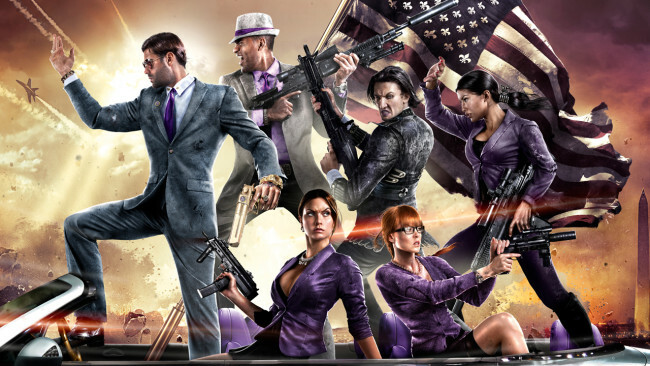 The demo for Saints Row IV began in the Whitehouse where a mix of characters old and new hustled and bustled (or did nothing, depending) to the beat of America’s political drum. Matt from The Deckers, the tech-oriented gang in Saints Row the Third, is now head of MI6 and Shaundi, Pierce and Kinsie also play a role in your cabinet. On my way to deliver a speech a new character played by Benjamin King (as himself) showed me two papers and asked if I’d rather cure cancer, or end world hunger. It’s unclear if that will matter in the game, ever, but it’s awesome that I get to make such amazing presidential decisions. Shortly after I punched a lobbyist in the face for accusing me of something vile, aliens crashed through the ceiling and abducted the entire supporting cast. These aliens, the Zen, are brutal, grotesque jerkbags who probably want to enslave Earth. What else do aliens ever want to do but enslave Earth? After losing a wrestling match with the head honcho and getting incapacitated, the demo switches to the open-world experience. There wasn’t any context to the transition, but I now had super powers and infinite ammo for every weapon, so naturally I ran around kicking civilians in the crotch. And not just kicking them in the crotch so hard they were propelled into the air. The super powers in Saints Row IV really do change up the feel and it’s nothing but awesome. Just running at supersonic speeds, through traffic, up buildings, then jumping miles into the sky is the sort of change to the most menial of gameplay elements that fits with games like this. Freezing cars, then picking them up telekinetically and launching them at hover-bike riding aliens is satisfying in a way that simply shooting them can’t compare to. The new weapons including the dubstep gun and the black-hole launcher (yes, black-hole launcher) are awesome, but the superpowers will be the reason to buy this game. I’ve played games starring super heroes before yet I’ve never felt such freedom and power. Let’s just hope it doesn’t get old. I just remember jumping into the air over an alien ship, then punching it into oblivion and crashing to the floor; not only did it feel awesome, it controlled perfectly. Quite the memory to take home. Saints Row IV releases on August 20, 2013 on Xbox 360, PS3 and PC.